This mini pendant will update your home with its eye-catching design. Featuring a brushed nickel finish and seedy shade(s), this fixture will accommodate a variety of dicor styles. With its easy installation and low upkeep requirements, this mini pendant will not disappoint. Evoking early industrial lighting, this brushed nickel industrial cage neckless shade adds a vintage touch to any decor. The shade features an brushed nickel finish and metal cage design with open bottom which replicates the feel of classic vintage fixtures. Add this shade to introduce a timeless industrial edge to both antique or modern spaces. Bring out the designer in you. This shade is part of the Westinghouse family of products. These customizable fixtures inspire creativity for quick and easy home upgrades. Simply select your fixture and finish, choose your shade, and enjoy your new custom lighting. For added vintage appeal use Westinghouse Timeless Vintage Inspired light bulbs (not included) to create the atmosphere you want. 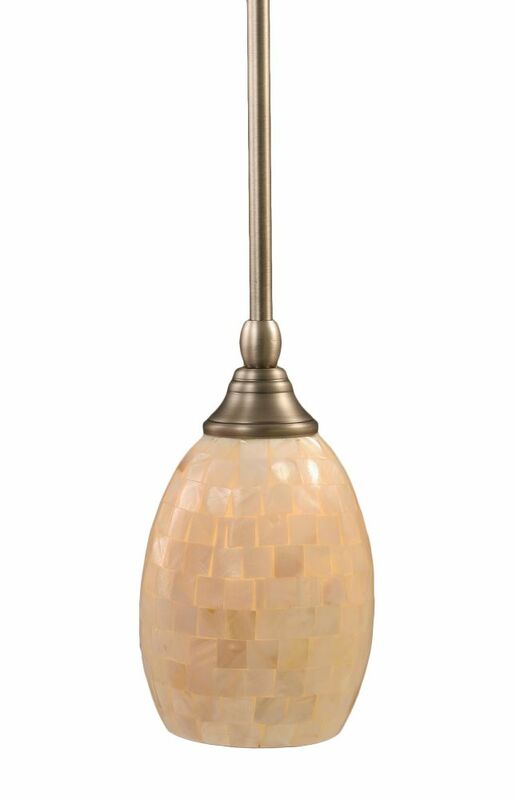 Concord 1 Light Ceiling Brushed Nickel Incandescent Pendant with a Seashell Glass The cornerstone of the Concord Collection is quality, and this incandescent pendant is no exception. Combining a classic brushed nickel finish and posh styling, you will find no better way to highlight the charm of your home. With the superb craftsmanship and affordable price this fixture is sure to tastefully indulge your extravagant side. Concord 1 Light Ceiling Brushed Nickel Incandescent Pendant with a Seashell Glass is rated 1.0 out of 5 by 1. Rated 1 out of 5 by HomeDepotCustomer from Loved it. It was beautiful looking,The problem was it was... Loved it. It was beautiful looking,The problem was it was uneven, You can not screw the top on evenly. For the price it was very poorlymade.Very disappointed!! !